Programmed Test Sources (PTS) makes RF synthesizers with good performance that are available for very attractive prices on the surplus market. While most of them are configured for remote control using a parallel interface cable, and don't have front-panel controls, there are several ways to work around that limitation. I've measured the phase noise and short-term Allan Deviation of a bunch of these synthesizers. The measurement setup I used shows the phase noise capability of the synthesizer; actual performance will depend on the quality of the reference oscillator used. For more details, see the discussion near the bottom of this page. 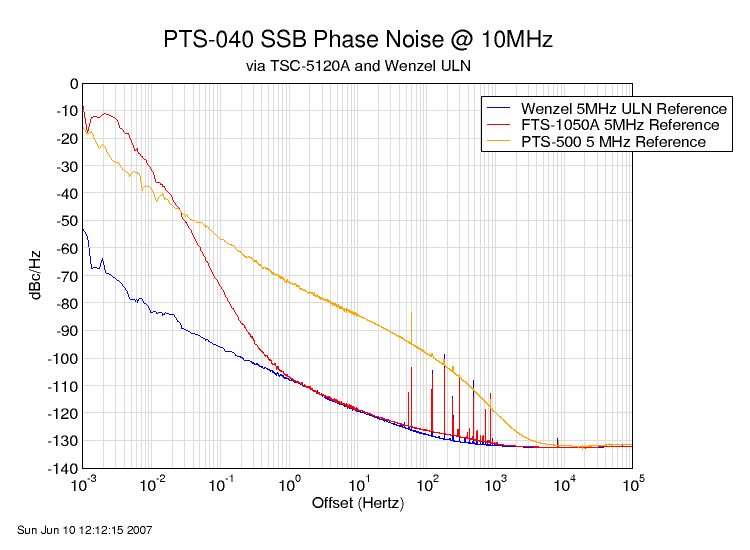 The PTS-X10 is a unique unit that covers only a 10 MHz range. They are available with ranges up to 100 MHz, but mine covers from 10 to 20 MHz. The published spec for the X10 is quite a bit worse than seen here. I suspect that's because higher-frequency units use greater multiplication, which increases the noise. But as you can see, the 10 - 20 MHz version performs very well. The PTS-250-SX51 is a special version of the normal 250 that has a switchable divide-by-ten circuit. When this is used, the result is a very low phase noise signal in the 1 to 25 MHz range. As you can see, this is the best performing of all the units at 10 MHz, and has by far the lowest noise floor. 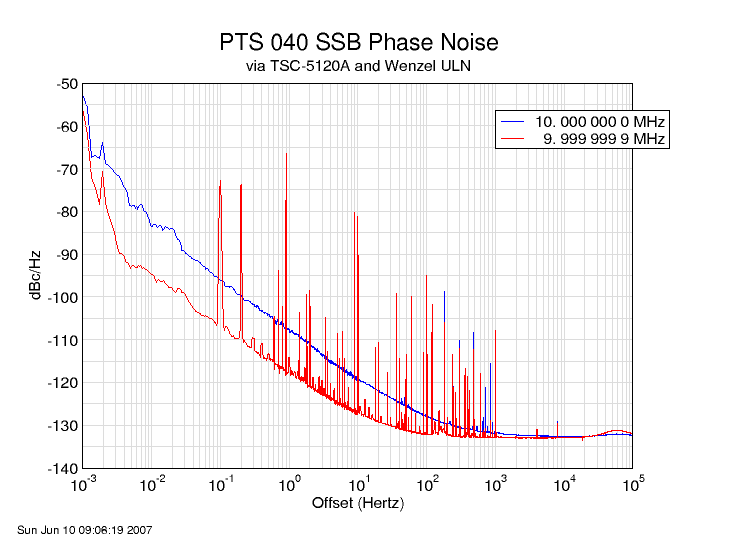 The PTS-040 is generally considered the most quiet of the standard units, and it's significantly better than the higher-frequency models. You can see that as the frequency range increases, the noise increases as well. However, I think there's something wrong with the PTS-160 that I tested, because its published specifications are identical to the PTS-250. It's clearly not performing that way, though. Frequency "resolution" here means whether the synthesizer is set to a frequency ending in lots of zeroes, or to one that makes use of all the decade divider modules in the unit. For example, is the noise the same when the dials are set to 10.000 000 0 MHz versus 9.999 999 9 MHz? As you can see below, no. The noise curve is actually a bit lower (see the next section for a possible reason why), but there are spurs at the decade points that are not present when the knobs are set to zero. This is far from an exhaustive test, but it appears that the finer resolution decades generate larger spurs; this makes sense as it's more difficult to separate closely-spaced signals than more distant ones. 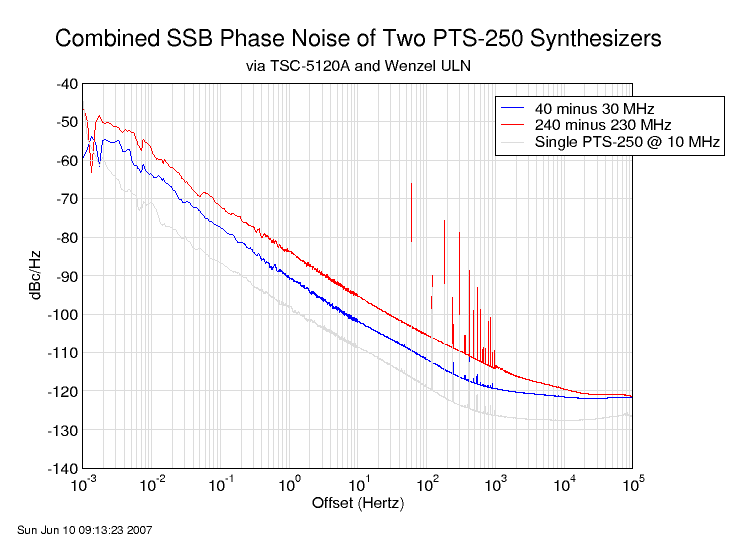 Because the PTS synthesizers use a multiply-and-mix scheme, it's likely that the noise will vary with frequency; if the process uses a higher multiple of the reference signal, you would expect the phase noise to increase. That might explain the lower noise (except for spurs) in the 10.000 000 0 vs. 9.999 999 9 test above -- at <10 MHz, the multiplication factor may be lower. I start with a Wenzel 5 MHz Ultra Low Noise oscillator. It drives a Mini-Circuits 2-way splitter. One output, at about +11 dBm, goes to the reference input of the TSC-5120A phase noise measurement system. The other output goes to a second 2-way splitter whose two outputs go to the reference inputs of a pair of PTS-250 synthesizers; they each get about +8 dBm. The synthesizer outputs drive an HP 10514A double balanced mixer. The mixer output signal will contain the sum and difference of the two input signals. If the two generators are set to frequencies 10 MHz apart, the difference frequency will also be 10 MHz. A 10.7 MHz low pass filter on the mixer output passes that signal while the blocking the sum frequency. The difference frequency goes into a 10dB amplifier and then into the test input of the TSC-5120A. I adjust the synthesizer output to get maximum output from the mixer (but not beyond that point). The output from the amplifier is about +8dBm, so it's right in the TSC-5120A's happy range. This 10 MHz output contains the combined noise of the two synthesizer outputs, translated down to a frequency the analyzer can deal with. This will of course be higher than a single synthesizer, but since both units are known to have similar phase noise, the output should provide a good basis for comparison. To determine the effect of frequency on noise, I first test with the synthesizers set to a pair of low frequencies -- 40 and 30 MHz. After plotting the noise, the synthesizers are set to a pair of high frequencies -- 240 and 250 MHz -- and the noise measured. The difference should give us an idea of how the phase noise is affected by the operating frequency. As you can see, the difference is around 7 dB, reducing as the offset increases; the noise floor doesn't change much between the two measurements. You can also see that the combined noise is significantly higher than that of a single PTS-250 operating at 10 MHz. 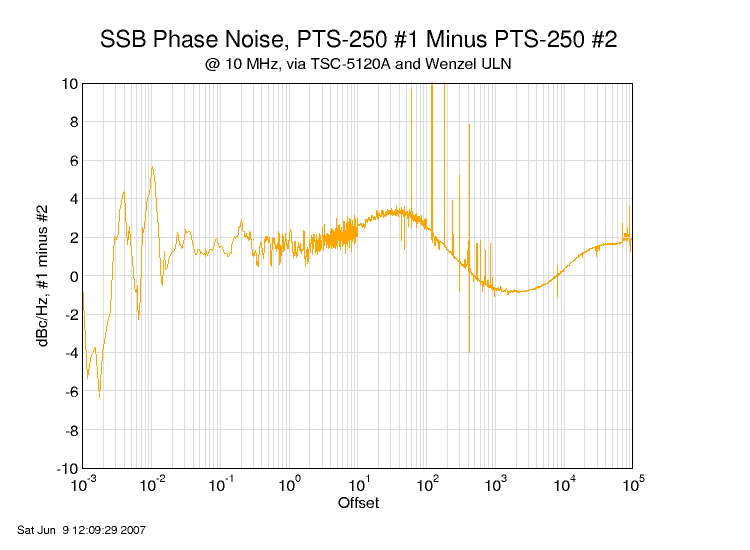 The 5 MHz output of a PTS-500 synthesizer (itself driven by the Wenzel ULN oscillator), which not surprisingly has significantly worse noise at all offsets than either of the crystal oscillators. I haven't yet figured out what detailed conclusions can be drawn from this data, but clearly the quality of the reference fed to the synthesizer impacts the close-in noise of the output.